Pizza Shop: We're Being Extorted For Bitcoin. What's a Bitcoin? Bitcoin, the preferred currency of hackers, fraudsters, and e-based ruffians everywhere, is now being extorted right in your own backyard—from your local pizza joint, specifically. Now the owners just need to figure out what a bitcoin actually is. 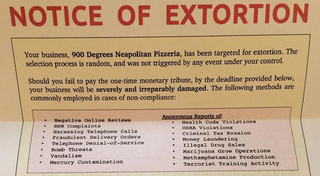 First reported by Krebs on Security, the official "notices of extortion" were sent via snail mail to several small pizza places across the country, each asking for one bitcoin ($644) apiece. If the shop doesn't pay up by August 15, though, that price goes up to three bitcoins ($1,932). People started realizing that they weren't alone in receiving the fairly menacing notes when shop owners began posting the letters on Facebook. And given the less than tech-oriented nature of the targets, it's not surprising that at least one of them amended the post with: "Ps. What the heck is a BitCoin??" There is a lot of operational security that these guys might have failed at, because this is interstate commerce, mail fraud, and postal inspector territory, where the gloves come off. I'm willing to bet there are several tools available to law enforcement here that these extortionists didn't consider.